A Bedouin is one, who was born and raised in the desert or mountain wilderness and lives alongside nature in black tents or in caves. Someone who raises goats, sheeps, donkeys, horses and camels and who knows how to milk and shepherd the goats and to ride the horses and camels. One who knows how to use all kinds of herbs as food, drinks and medicine. A person who can navigate and live with ease in the desert. His life is simple - but his famous hospitality and generosity is no myth. A Bedouin accepts and appreciates what he has and is willing to share this. He is happy to give and to assist. He is proud of who he is and is loyal to his land. A Bedouin sees bounty where you perceive barrenness and finds poetry in everything. It is more than a name, it is a way of life. We belong to the Raschaida Family in Saudi Arabia. About 250 years ago our great grandfather Zeydan left his country and came to Egypt. After different stays all over Egypt he finally settled in Dakhla. He had a lot of camels, goats and sheeps and the inhabitants of the oasis were quite afraid of us in the beginning. 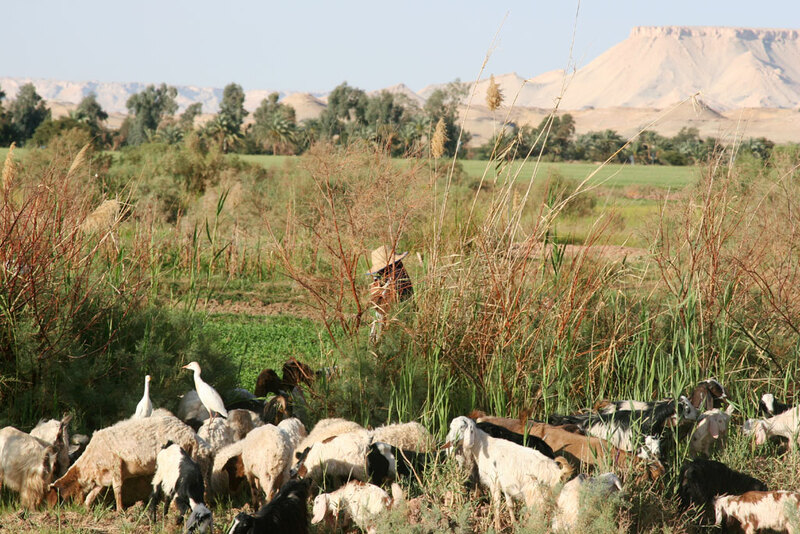 Our great grandfather offered the poor farmers to collect the dates and olives they grow to bring them by camel caravan to the markets in Assiut. So they shared together in business and succeeded alltogether. Through this way the first routes were formed in the desert to come to Kharga, Assiut and Farafra. Over time the life changed a lot and technical development also arrived in the oasis. So we started to be farmers and worked in the fields, built houses in our Bedouin Village El Dohous and sent our children to school. Later Dakhla was visited by more and more tourist and like others in Mut, the capital of Dakhla, we also started to work in tourism. Long time ago tourists came to Mut, the capital of Dakhla, and asked, where they can find a place to camp with their cars and if there are real Bedouins in the oasis. We had a lot of camels, goats and from our place - a nice overview of the desert. We welcomed the tourists in our homes like our guests, gave them food, tea, water and all what we had. We tried to do our best and according to our Bedouin hospitality we could not charge them. So the tourist asked us to build a special place for tourists. And the idea grew in our mind until we got ready to make a new project. We chose a nice place close to our village on a little hill to build something very simple and nice with palm trees, leaves and natural material. We started our touism business with six little huts. 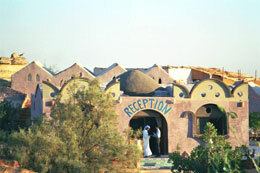 Our guests became happy and satisfied with the place and our hospitality. It was learning by doing that made us better and by the years the place grew bigger and bigger until we decided to build a new and more comfortable hotel for our guests. In 2004 we started to build the new hotel close to our tradition and life, but with modern facilities. We tried to make our hotel a little oasis in the oasis to give you the chance to relax completely. But with all the work in tourism we didn't loose our roots and so we still live very close to our tradition and culture and we try to give this feeling to our guests. The Oasis people are different from any other place because every village lives like a family. Between the people is more respect and all of them know each other. The oasis people are friendly and smile for the guest. You feel welcome wherever you come from until you feel you are from here. Most of the people work like farmers and on the palm tree plantations. Between this people is a strong culture and tradition. When one family is happy for any reason or celebrating an event all the people of the village share and are happy with them. Or if somebody dies all are sad and carry the sadness and come to the funeral. In our oasis we have many different springs, some cold, warm or hot springs. On one side of the oasis is a mountain with many different colours and rocks and on the other side are sand dunes. And between the both you can find little oasis with some houses or farmers. We have a lot of villages and every village has a different style for buildings and view of the nature. 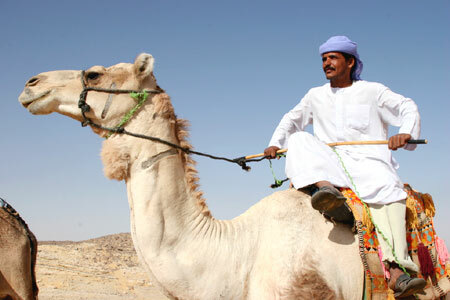 Come and visit the ancient places of Dakhla, like El Qasr, El Qalamun, temples and more.